You’ve likely seen a few products in today’s consumer market that bear the “Paraben-free” label, but you might not know exactly why that is tout-able. It may also be a bit unclear just how many products you use everyday that still contain parabens. Let’s take a quick but clear look at the paraben path. 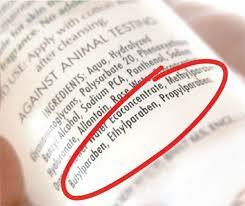 Parabens (methylparaben, propylparaben, ethylparaben, and butylparaben) are the most commonly used preservative in personal care products. They are used to prevent microbial growth, namely mold and bacteria. Since most personal care products are made up of mostly water, and the products sit in warehouses, on store shelves, and then in your home for many months in warm environments, it’s simple science that mold, fungus, and bacteria will begin to grow. Soon your lotion will begin to look quite swampy. Preservatives are a necessary ingredient in nearly any product that contains water. Parabens are cheap and they kill a broad spectrum of potential invaders. Different parabens work within a specific spectrum, which is why you will often see several different parabens combined in a product. Parabens were reviewed by the Cosmetic Ingredient Review board (CIR, the self governing cosmetic industry group) in 1984, and were deemed safe for use, partially due to the belief that only a minimal amount of parabens are actually absorbed through the skin. In 2003, due to the pressure from the public and a few safety groups, the CIR began the process to reopen the safety evaluation. This “process” took nearly two years and finally in 2005, the paraben case file was reopened for safety evaluation. This peer-review board CIR group, once again, determined that parabens were safe based on their estimation of consumer exposure. So, essentially the CIR made a guess as to the amount of parabens that the average consumer is exposed to and based on that guess, they deemed it safe, again. Meanwhile, numerous scientific research studies were reporting that parabens were showing up in breast cancer tumors. In one study in the United Kingdom, every single breast cancer tumor they examined contained at least trace amounts of parabens (granted it was a small study of only 20 patients). One of the key issues is that parabens mimic estrogen in the human body and many cancers depend on estrogen for their survival and growth. In addition, clearly when a chemical is acting like a hormone in your body and that hormone level is changing day after day based on the products you use, that alone is disturbing. Men are not exempt from these estrogenic ill effects. Numerous studies have shown that parabens directly damage the DNA of sperm and can disrupt fertility. Initially when parabens came on the scene, as mentioned earlier, the belief was that the risks were low because they were not readily absorbed. Today scientific studies performed on animals show that parabens have quite a high rate of absorption and are readily taken into the body through the skin. Researchers estimate that the average consumer is exposed to 76 mg of parabens everyday with 50 mg coming from personal care, 25 mg from pharmaceuticals, and 1 mg from food (The Health Controversies of Parabens by Mark G. Kirchhof, MD, PhD, Gillian C. de Gannes, MD, MSc, FRCPC). While the overall research data is cloudy as to the definitive safety of parabens, it seems clear to me that I do not want a chemical that tricks my body into thinking it is a hormone anywhere near me or my family. Once again, I cannot stress enough how important it is to read the labels of every bottle, tube, tub, can, jar, packet, box, stick, etc. that you bring into your home as a consumable product. Unfortunately within our current system, the onus is on the consumer to ensure that what goes on, or in our bodies is safe. Hopefully this will not always be the case.